Social Q&A services are springing up everywhere because often search is too cumbersome or imprecise to answer our questions. This is especially true on mobile phones. A new iPhone app called Crowdbeacon attempts to answer your questions with a local twist. It is designed to answer questions about restaurants, shopping, services, and activities in your immediate vicinity. 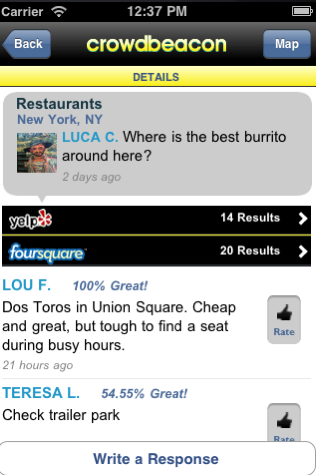 The answers come from other users, local experts, and business owners, as well as Foursquare tips and Yelp reviews. Crowdbeacon reminds me a little of Aardvark, the social Q&A service that was bought by Google. When you join Crowdbeacon, it asks you what categories you want to answer questions about and it routes those questions to you. But it’s primary filter is your location. If you know a lot about antique shops, it will only send you questions about antique shops near where you live. Business owners can also sign up to answer questions. If someone asks a question within six blocks of their store in one of their designated categories, they will receive it via push notification on their iPhones. Some will no doubt try to lure questioners into their stores and turn them into customers, but others will realize that simply offering up their knowledge can generate goodwill and good buzz. To supplement the realtime answers from other users, Crowdbeacon will also surface related tips from FourSquare, reviews from Yelp, and shopping info from local shopping search engine Wishpond. Over time, the app will fold in answers from other APIs, including Twitter, OpenTable, and SinglePlatform. It uses basic semantic analysis to place this information into different categories so that they can function as answers when called upon. It also forces you to choose a category before you can ask a question, which can be a little tedious. Crowdbeacon is a bootstrapped startup was founded by Robert Boyle, who is an entrepreneur-in-residence at interactive agency Squeaky Wheel Media. He also helped launch Glassbooth, a non-profit website that tries to match people with the political candidates who share their beliefs. Competitors to Crowdbeacon include Loqly (iTunes link) and still-in-private-beta Localmind, which will let you SMS questions to people who are checked into a location on Foursquare.